Re-activate; our re- word for week 2 of the series RE:. Last week we revealed the missio di, the mission of God. This week we are delving into reactivating ourselves and the church in light of God’s mission. The ultimate mission of God, and the reason He created us, is to glorify Himself. God’s Word is easily and often contorted into applying directly to us individually, as if it were written specifically about us. Don’t get me wrong, God is all about you; but at the same time, it’s not about you. God is for your joy, but He is for it so that He is glorified through it. So, how do we receive this joy? By obeying the commands we’re given by God for living. In an ironic twist, what we have in the Bible that the world judges as life and joy-restricting rules is actually life’s instruction manual for happiness. Wait, what? Did I just say following the Bible is the means to our happiness, not the guidelines that, if followed closely enough, appease an angry God? Yes I did. Pulling from Dean’s beach observations, God is just as pleased when the sea gull He created soars over the waves as when it poops on the unsuspecting sunbather. Both processes utilize the biological mechanics He designed, but our limited perception values seeing the gull soar and is disgusted by any manner of defecation! If the mission of God is to make much of Himself, then what is the mission of the church? Discipleship. Not just convincing someone to say some ultra-spiritual magic words or winning a theological debate, the kind of discipleship that walks people through positive life change. Discipleship as a lifestyle. Now the eleven disciples went to Galilee, to the mountain to which Jesus directed them. And when they saw him they worshiped him, but some doubted. And Jesus came to the and said, “All authority in heaven and on earth has been given to me. Go therefore and make disciples of all nations, baptizing them in the name of the Father, the Son, and the Holy Spirit, teaching them to observe all that I commanded you. And behold, I am with you always, to the end of the age. Jesus’ parting words to his closest friends, go make disciples by teaching them what I’ve taught you and the command them to go and teach more. We are the current members of the “all nations” Jesus refers to; the ones who should observe all that Jesus commanded to the eleven (including his final command to disciple the world). How does this pertain to you today? The church today modifies its programming and embraces traditions by popular vote to keep up numbers. You don’t need another Bible study, you need to observe what you’ve already learned. Translating today’s message visually, I pulled from several sources. Chasing UFOs is a show I’ve gotten into watching recently, purely for the entertainment value. The last episode we watched researched videos, eyewitnesses, and even a proclaimed alien fetus. None of the video or witness stories could be conclusively confirmed or busted (of course) but the preserved “alien fetus” was obviously the body of a small marmoset, a popular central American pet. The body in today’s drawing mimics the marmoset. The gospel is referred to as “living water” in the recount of Jesus’ conversation with the woman at the well (John4:10). The first step of following Jesus in discipleship is public baptism, a ceremonial washing that displays your commitment to following Jesus’ commandments in front of your closest friends. A stream of living water flows down from the top of the page onto the dry human carcass. As this water hits the body, it brings life back to the decaying shell, regenerating the muscle and skin that once animated those dry bones. The point where the water hits the body, light is most concentrated, symbolizing life. 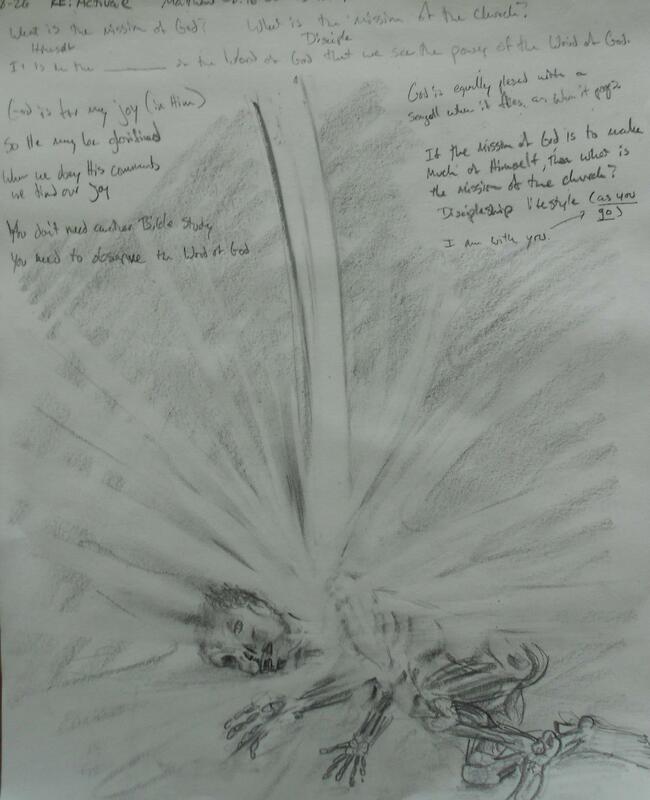 The light splashes outward, reaching out to other dry bones through the reactivated body. This is God revealing himself through us, reactivating us in order to reactivate others through us. 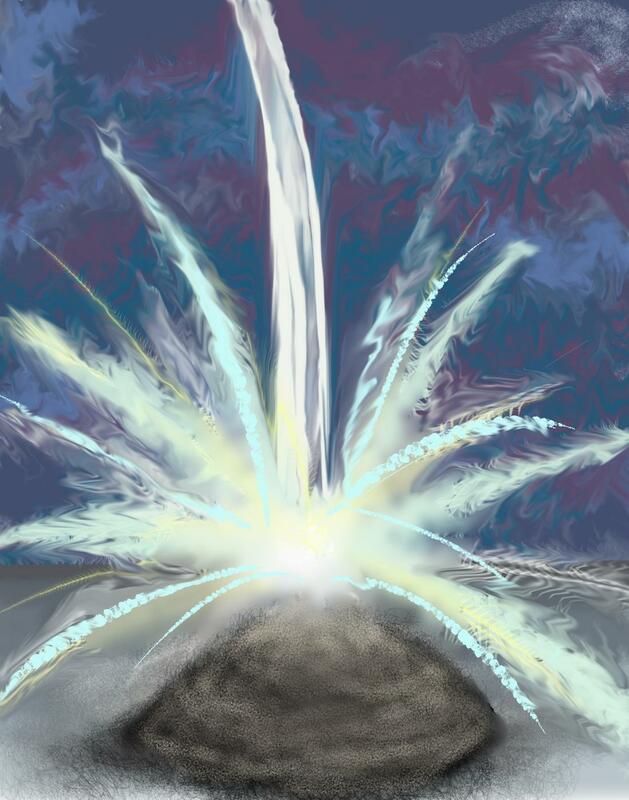 Below is the digital interpretation of today’s drawing, living water reactivating ashes. Love the digital image here, man. Thanks, Jason! I’m still an amateur with the program, but I am pleased with this one (considering I drew it with a 10 month old on my shoulder!). The next step is adding Photoshop and tap into some realism.